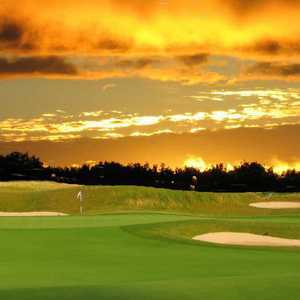 KEWADIN, Mich. - It takes some guts to open up a new golf course in northern Michigan, an area with an oversaturated golf market - more than 100 golf courses within an hour of Traverse City - and an economy that's anything but fruitful. The new Sundance course at A-Ga-Ming opened in 2005 and compliments the original course, now named The Torch. But A-Ga-Ming Golf Club, located 20 minutes north of Traverse City in Kewadin, is flying in the face of stiff competition. 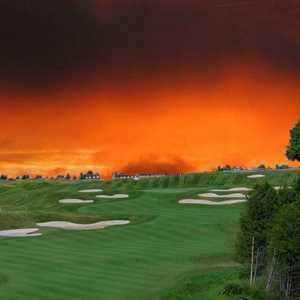 Last spring the club doubled its presence in the northwest Michigan market, adding a second course, the Sundance, to complement its original 18 holes, named the Torch. The new Jerry Matthews design has all the traits of a modern course: five sets of tees, nearly 7,000-yard length, plenty of bunkering and big, multi-tiered greens, as well as elevated tees and the downhill par-3 17th featuring stunning views of the area. But don't be quick to dismiss the original, which features the club's best stretch of holes in terms of both scenery and playability. Nos. 7 through 10 offer high drama and incredible views of Torch Lake. Of course, the Torch is shorter, with mostly flat greens and fairways that actually require precision to hit. It's in the classic northern Michigan mold, forged before big money and big-time designers came in with their bulldozers and were awarded an extra 100 acres to build the same number of holes. The Sundance needs a little time to grow in certain areas, most notably the 10th green, which still has plenty of bald patches. Certain spots in the rough are also hard and rocky. The heather that lines many of the holes remains very short and hardly penal. Once it grows, difficulty is sure to follow suit. The new course's first and 10th holes mirror each other, located at the high point of the property and offering similarly panoramic views. Both moderately sized par 4s have subtle doglegs, elevated tees and heather protecting the fairway. The approach shot on the first is a little trickier than on the 10th, which features one of the deepest greens on the course and a false front to the left side. The par 5s, especially on the back side, are just begging to be reached in two with a couple of good pokes (both are about 500 yards from the blue tees). There's little trouble besides a few bunkers about 50 yards out, which almost discourage lay-ups and encourage going for it. No par 4 on the front side is longer than 400 yards from the professional tees, making short-iron play a bit redundant. Don't think for a second that you can't use your driver on any of these; this course was built for swinging away. No. 2 is the shortest of them at just 337 yards. There's some room to run it up to the green if you've got a big drive and some wind behind you. Water only comes into play twice on Sundance, on No. 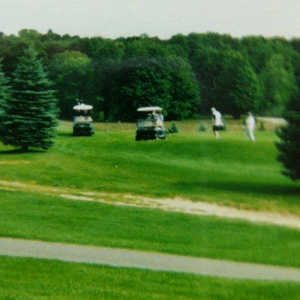 3, a short par 3 with water protecting the front-right side, and again on the 18th, where water again sits front-right. This makes the Sundance quite friendly for those whose ball budget is a little depleted, but once the heather grows out things will change. The Sundance is basically your standard quality modern course - long, plenty of land-shaping and massive bunkers - but it might need a few years to grow in before becoming a prime local play. For now, consider playing the Torch. A-Ga-Ming's old layout has the kind of distinctive charm and character the Sundance can only hope to gain with age. There's little sign of artificial mounding or land-moving, and fairways are often guarded heavily on both sides; it clearly wasn't intended for space-age drivers that spray the ball 300 yards in every direction. The Sundance currently gets more rounds played, according to course officials, so chances are you'll also enjoy a quicker, more wide-open round on the Torch. Summer rates are $74 including cart on the Sundance, $64 on the Torch. A-Ga-Ming has one-, two- and three-bedroom condos for rent on the property. The newest unit is a one-bedroom Jacuzzi suite with the added bonus of breathtaking views of Torch Lake. A series of improvements at A-Ga-Ming have raised the resort's Golf Digest rating from 2½ to 4 stars.